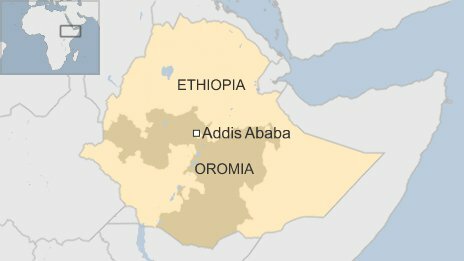 BBC Ethiopia analyst Hewete Haileselassie says some ethnic Oromos feel the government is dominated by members of the Tigray and Amhara communities and they would be loath to see the size of “their” territory diminish with the expansion of Addis Ababa, which is claimed by both Oromos and Amharas. U.S. Secretary of State John Kerry arrived in Ethiopia’s capital, Addis Ababa, Thursday in the first leg of his three-nation trip to Africa “to encourage democratic development.” He came to a country rocked by mountingstudent protests against the government and vicious military crackdowns that left scores dead and wounded, as well as the troubling imprisonment of dissident journalists and bloggers. 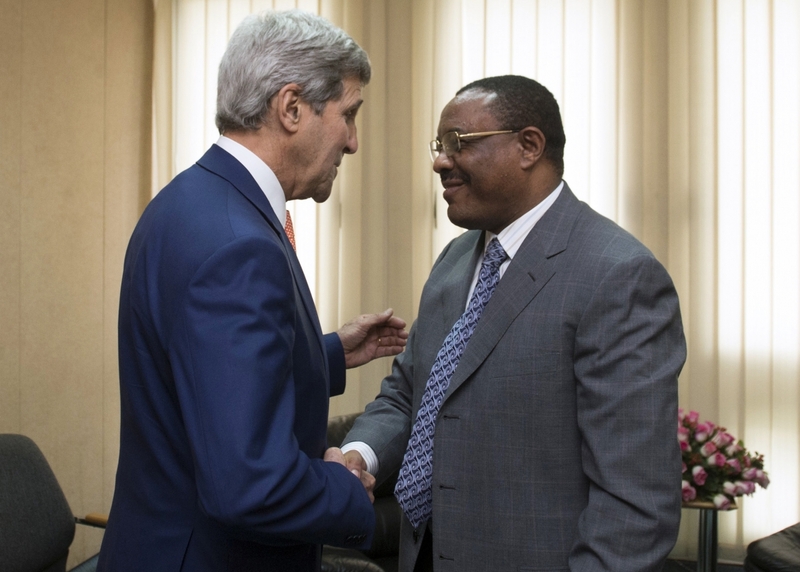 To his credit, Kerry raised concerns about the tightening of press freedom in Ethiopia. “I made clear to Ethiopian officials that they need to create greater opportunities for citizens to be able to engage with their fellow citizens and with their government by opening up more space for civil society,” Kerry told reporters in Addis Ababa. However, his discussions with Ethiopia’s leaders were overshadowed bySouth Sudan’s implosion — with continuing fragility in next-door Somalia, and souring Egypt-Ethiopia relations stirred by Ethiopia’s construction of the Great Renaissance Dam over the Nile, in the background. This focus was unfortunate but hardly surprising. For over two decades, despite fleeting statements expressing “concern,” Washington has shied away from seriously engaging Ethiopian authorities on the need for genuine democratization. Without the latter, the country’s extended prosperity is in danger. “To support economic growth for the long term, the free marketplace of ideas matters just as much as free markets,” Kerry noted in his remarks. But he failed to underscore how rising instability could erode Ethiopia’s standing as a linchpin to the otherwise volatile Horn of Africa region’s stability and damage its newly minted image as an emerging economic powerhouse. Reports of the number of dead vary, but in clashes with security forces over the last few days, locals say at least 20 protesters have been killed and many others wounded in Ambo and Robe towns. The government acknowledged 11 deaths, adding at least 70 students were wounded in a bomb blast at Haramaya University in Eastern Oromia.Swedish and U.K. embassies in Addis Ababa updated travel warnings for their nationals urging those in Ethiopia to avoid visiting the area. Ethnic Oromo students are protesting against a new urban development plan unveiled in April by the Addis Ababa city administration. Protesters say the city’s master plan, devised by ruling party functionaries without public input, would allow the sprawling metropolis to swallow up surrounding Oromo towns and rural villages. Protesters fear the new plan would facilitate the eviction of thousands of farmers from their ancestral lands without proper compensation — an unjust process that has been happening since the city’s founding a century ago. Their land would be sold at dirt-cheap prices to foreign and domestic investors, exacerbating the country’s growing income inequality and diluting the Oromo national identity. In addition, the plan would condemn the Oromo, Ethiopia’s single largest ethnic group, to being an agrarian population in a fast-urbanizing country and balkanize their homeland into an eastern and western half — in a manner reminiscent of occupied Palestinian territories — leaving the state of Oromia with only nominal control. The ongoing protests and crackdown on freedom of expression are the latest signs of growing discontent and Addis Ababa’s increasing authoritarianism. The U.S. State Department’s annual human rights report, released by Kerry on Feb. 27, details Ethiopia’s worsening human rights situation. In recent years, the country’s adoption of a spate of draconian laws, including its Charities and Societies Proclamation and Anti-Terrorism Law, has given security and intelligence forces and the vengeful judiciary carte blanche to criminalize all forms of dissent and to arrest opposition leaders. While the student protests have so far been confined to college campuses, they echo a long-simmering popular grievance. The Oromo make up close to 40 percent of Ethiopia’s population of 94 million, but are conspicuously marginalized in that country’s political, economic and social life. The government’s refusal to address their complaints is a major bottleneck on the country’s democratization. The limits on free speech, the violent suppression of protesters and imprisonment of political leaders and bloggers portend ill for the future of Washington’s ally Ethiopia. The Oromo student protests are not new. Since 2001, sporadic student-led riots have rattled the state — the most potent being in 2006 following botched 2005 elections. The ire of past protests has been mainly against the Oromo People’s Democratic Organization (OPDO), the junior partner in the ruling Ethiopian Democratic Revolutionary Front (EPRDF). This time around, the rank and file of the OPDO seems to have resigned itself to the inevitability of protests by going public with its disapproval of the master plan. This has forced the party’s top echelon to scramble, mostly in vain, to downplay the plan’s shortcomings and tout its envisaged benefits. Far from reassuring, their comments fueled more protests and emboldened those agitating for an outright rejection of the ruling party’s 22-year-old rule. The state-run media have also shown some murmur of dissent. In a rare sign of independence, the regional TV Oromiya aired comments critical of the plan in April. Unlike protesters of years past, who universally rejected the legitimacy of the Ethiopian state, today’s students are calling for perfecting the union — by designating Oromo as one of Ethiopia’s official federal languages; judiciously implementing the country’s 1994 constitution, which crafted nine states on the basis of linguistic criteria; and releasing all political prisoners. The students’ moderation notwithstanding, security forces have characteristically responded by using disproportionate force. Since the death in 2012 of the country’s mercurial Prime Minister Meles Zenawi, who ruled with an iron fist, the EPRDF has been struggling to maintain its hallmark of internal cohesion. Party discipline was severely strained during the murky transition as well as the two-year-long sit-ins by the country’s restive Muslim population. The ongoing violent crackdown on peaceful protesters — who include rank-and-file members of the OPDO, which constitutes 5 million out of the ruling party’s 7 million members — is bound to test the EPRDF’s unholy alliance. Ethiopia’s current political dispensation as a nominal ethnic federation overseen by the overlordship of the powerful Tigrean ethnic elite is severely contested. While the Oromo are pressing for making the federation more meaningful, ethnic Amhara elites, Ethiopia’s traditional rulers, are calling for the dismantling of the country’s ethnic federalism — likening it to a ticking time bomb threatening Ethiopia’s unity and territorial integrity. The limits on free speech, the violent suppression of protesters and imprisonment of political leaders and bloggers portend ill for the future of Washington’s loyal ally. Kerry’s restrained nudging did not appear to have swayed Addis Ababa toward political liberalization. Although U.S. leverage has clearly waned in recent years, Kerry should have used his visit’s huge moral weight. As a high-ranking member of the Senate’s Foreign Relations Committee, he was a fierce advocate for democracy and human rights. His strong support for Ukrainian protesters in their recent standoff with former President Viktor Yakunovych, however, contrasts with his decision to side with the military in hijacking the Egyptian revolution, which had briefly stoked high hopes for regional democratic transformation. Security forces may temporarily silence the current student uprisings in Oromia and contain rising indications of potentially catastrophic urban disturbances ahead of the 2015 elections. But the status quo is untenable. Unless held in a free, fair and inclusive manner, in a marked departure from previous elections in which the ruling party claimed hollow victory thanks to its tight grip on all state institutions, the upcoming elections will no doubt mark a watershed moment for Ethiopia’s democratic transformation or its irreversible derailment. To encourage democratic development, the professed aim of his trip, Kerry should have insisted that Addis Ababa embrace the growing chorus for liberalization. This includes a firm statement calling for an end to the repression of peaceful protesters in Oromia and the opening of the political and press environment, both of which are now monopolized by the ruling party. Instead, the U.S. ultimately missed another opportunity to push for a peaceful and gradual transition to democracy in a region marked by tyranny and volatility. Hassen Hussein is an assistant professor at St. Mary’s University of Minnesota, a longtime democracy activist and a leader of Ethiopia’s largest ethnic group, the Oromo.